Accent your home, office or boutique with this stylish and luxurious collection of round ottomans. 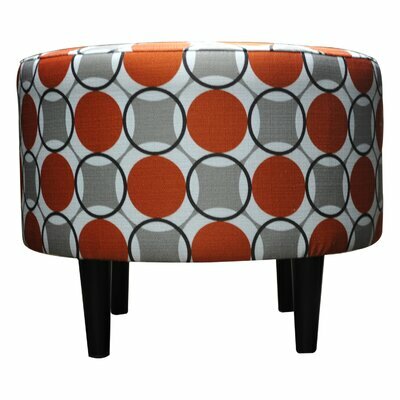 This round ottoman collection is comfortable and trendy. Ideal for small rooms or as accent pieces, these round ottomans promise years of reliable services. They offer you a wide variety of upholstery fabrics including linen, polyester, faux leather and velvet in an array of natural and vibrant colors to select the one that you like most. 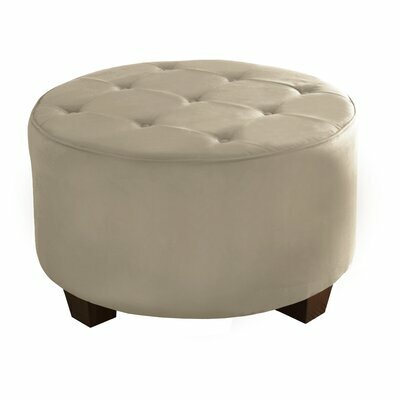 Stylish and versatile, the Balamine Round Tufted Ottoman will adorn your room décor. Ideal as a comfortable ottoman or a coffee table, it is a valuable addition to your home. It features glamorous look with natural colored upholstery that is further accentuated with gorgeous tufts on top and silver nailhead trim detailing all around the base. The classy turned legs complete the look. Add a stylish flare to your room décor with the gorgeous Hargrave Tufted Storage Ottoman. Crafted from oak wood for long lasting durability, this ottoman promises years of reliable services. It is wrapped in asparagus colored, plush velvet upholstery for a comfortable and relaxing seating experience. 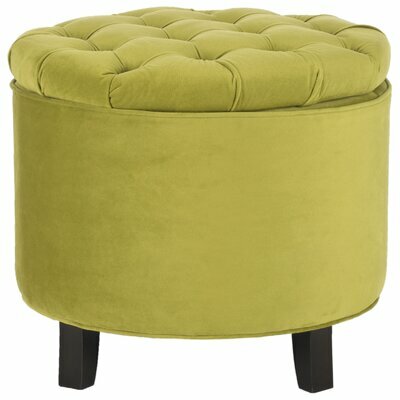 It features classy pouf design and tufted top that is very appealing and chic. 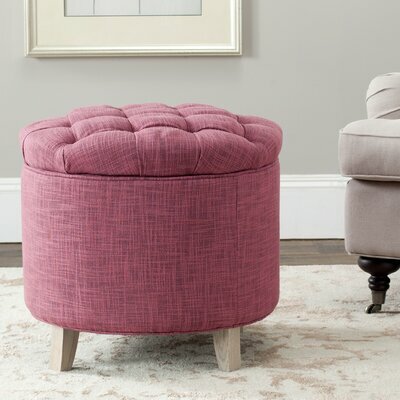 Adorn your room décor with the stylish Urban Unity Domani Swivel Ottoman. It features wooden frame which promises long lasting durability. 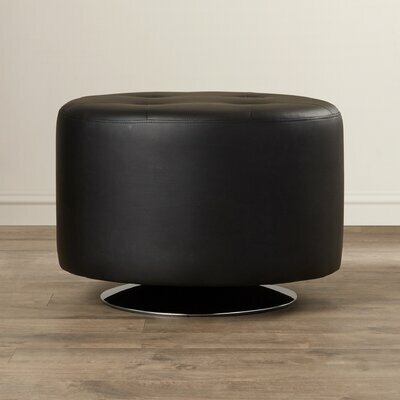 It is a round swivel ottoman that has cushioned top for comfortable seating. The top features four deep tufts that look gorgeous. It can also be used as a footrest. 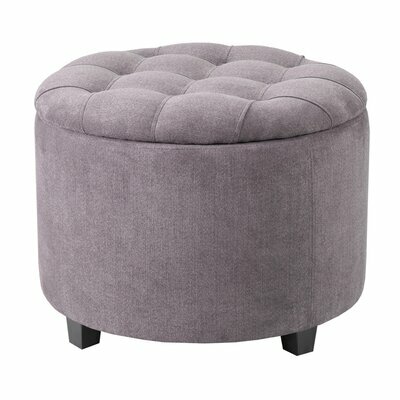 This lovely swivel ottoman is available in multiple colors and will be a valuable addition to your home, office or shop. 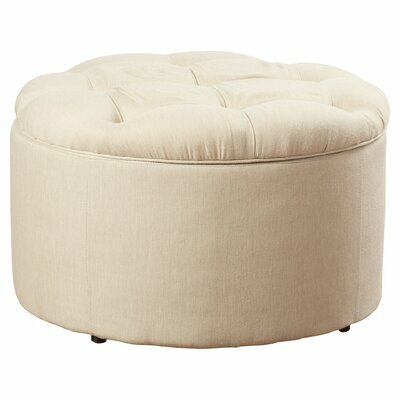 The Claudine Round Storage Ottoman is very stylish and practical. 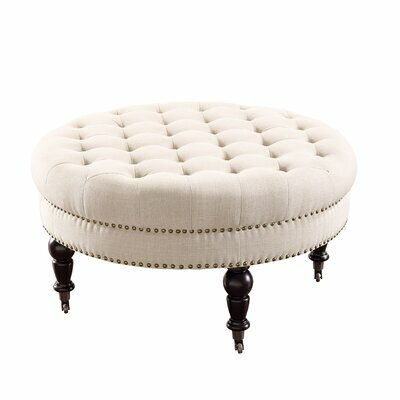 It features round shape with tufted top that looks simply gorgeous. It has 11 inches wide storage compartment with designer shoe storage insert and 10 pockets that line the internal surface of the ottoman. The Lenore Upholstered Storage Ottoman combines style and functionality. Classy and elegant, this ottoman is a perfect blend of comfort, functionality and style. It features ample storage space for keeping your shoes and other household items. The strong and robust wooden frame ensures years of reliable use and best service. Polyester blend upholstery in off-white color is soft and plush. This comfortable ottoman will prove to be a perfect addition to any room of your home. Product care: Vacuum frequently or do light brushing to prevent overall soiling. Spot clean with dry cleaning products or mild water-free solvents. Do not use steam or water-based cleaners as they may cause staining or excessive shrinking. Designed specifically for modern themed spaces, the lovely Domani Swivel Ottoman is perfect for your home, boutique or office. 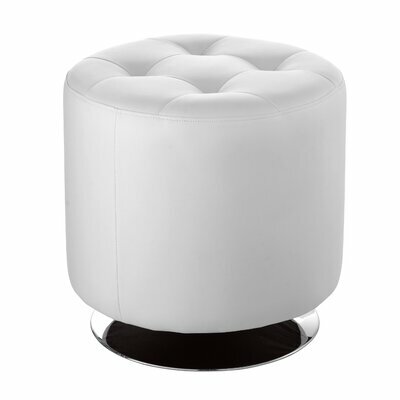 The white faux leather upholstery and tufted cushion top give this swivel ottoman a chic and stylish touch. This contemporary styled ottoman features a sturdy and durable wooden frame that renders strength and sturdiness to it for many years of best service. The luxurious and refined Domani Swivel Ottoman by Sunpan Modern is available in a range of appealing vibrant colors to let you select the best one that perfectly meets your styling requirement. 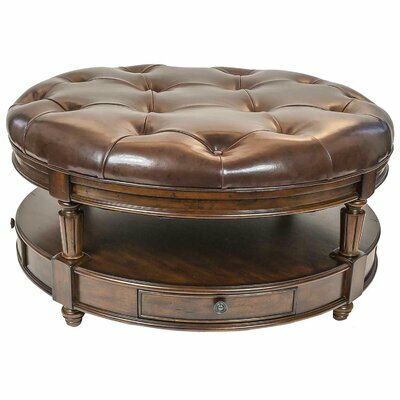 The exquisitely designed Alcott Hill Castell Storage Ottoman is unprecedented in quality, style and comfort. This ottoman is very comfortable to sit on. It features wooden frame for years of durable and reliable use and polyester and linen blend upholstery that is soft-to-touch and easy-to-care. It has beautiful rose colored upholstery and tufted cushioned top that make this ottoman equally suitable for use as an accent piece. The handcrafted Skyline Furniture Premier Lounge Ottoman is extremely comfortable and stylish. Covered in gorgeous lazuli colored upholstery and further adorned with button tufts, this ottoman showcases a stylish look that is hard to overall. It features plush cushion for comfortable seating. This lovely ottoman will be a perfect addition to any room of your home or office. Frequent vacuuming and light brushing is recommended to remove dust and grime and to prevent overall soil. Spot clean with the help of dry cleaning products or mild water-free solvent. Do not use and cleaning agent containing carbon tetrachloride as it is highly toxic. Always pretest a small area and clean in only a well-ventilated room. It is recommended to hire the services of professional furniture cleaning technicians. Create a stunning focal point in your home with the richly styled Windsor Ottoman. This sophisticated ottoman will take your breath away with its incredibly intricate floral and leaf carvings in fruitwood finish. Featuring Asian hardwoods and veneers, the frame of this ottoman is sure to last long and witness many seasons with you. The seat cushion is upholstered in bonded leather that intensifies the elegance and sophistication of this classic beauty. A pull-out drawer and spacious shelf under the seat cushion provides ample space for keeping your items or showcasing your decorative pieces. It is ISTA 3A certified and stays safe and damage-free while in transit. Vibrant and eye-catching Sole Designs Sophia Ottoman will add a stylish flare to your room décor or boutique. This ottoman is very stylish and promises comfort for many years to come. Crafted from premium quality materials, the Sophia Ottoman is durable and long lasting.